With the receipt of an invitation from MCF to participate in the National Closed Championships we in KLCA have circulated the same to all council members for further dissemination. Of course any interested party who is in KLCA or who is eligible and who wishes to be a member of KLCA can write in - our Hon. Secretary is Amirul Mohamad (E-mail: amfa177@gmail.com) - and it is timely as we are also starting to expand our membership. I have on my end begun to contact those highly ranked on either of both the FIDE and MCF rating lists who have played for KLCA in previous championships and one of them is Dilwen Ding. Shireen, Dilwen's mother, said she would get back to me and then took the opportunity to update me on the progress of a former student at Polgar Chess Asia where his foundation was developed and where it was clear then that his big problem was lack of maturity and the strength of will to fight. 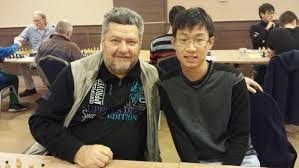 Now his mother also told me that he had spent a month training with GM Wang Rui in China before rushing over to play in Myanmar and as a result fell ill and that was basically the reason for his poor performance there. She also mentioned she had read my remarks on Jimmy's blog and agreed he should play locally and give back points to which I pointed out he could instead show his quality and not do so! Bottom line, I think a few things about all this jump right out, the first being of course that it remains a question if he will actually play in the national championship and/or Asian Schools or ASEAN+ Age Groups and be able to show to all his progress from all this training and playing. I hope we won't have an explanation of a non compete based on having exams coming up, now time to reduce chess as too much time already spent last few months, etc. Secondly you have to marvel at the money spent and his mother's dedication over a long time even if the recent training and trip must have been a bomb by itself because it is huge by any standard but we should also appreciate this spend has been done by more than a few others already! Not just Aron Teh, but many young players who have been playing in various international age groups events now for years and whom I don't wish to directly mention. In my time many of us made such sacrifices but we did not have money so it was at expense of career, other opportunities given up, even delayed families and the pattern was repeated with the generation after. A lesson for some that it takes quite a bit to excel and there is never any guarantee it will pay off but that is ultimately what it takes!